Several roads throughout the county are closed because of downed trees, limbs and power lines. 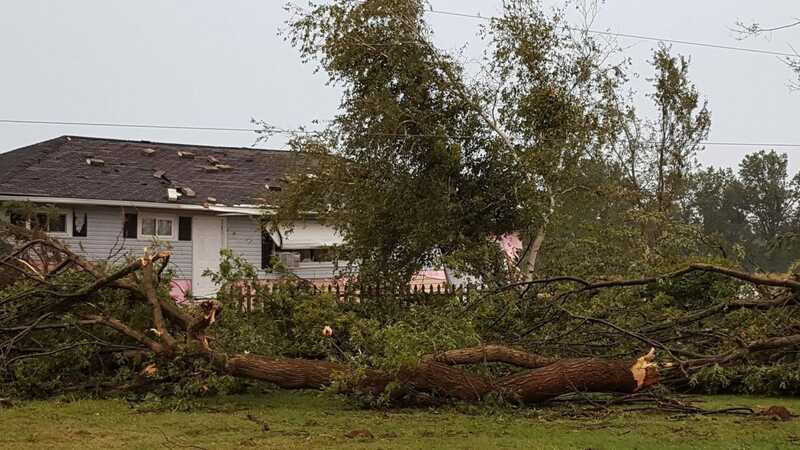 The area around North Robinson saw significant damage and the decision to close Colonel Crawford Schools was made shortly after 5 a.m. If you have photos of storm damage in your area, and want to share them, email them Russ Kent at rkent@aimmediamidwest or galnews@aimmediamidwest. Residents in the north end of Galion were without power for several hours this morning. At about 4:30 a.m., the electricity was restored, but just a few minutes later it went out again. Electric department workers were working at the sub station in Heise Park. Mosty street lights in the uptown area of Galion are on, but some stop lights were not operating early this morning. Motorists should treat those intersections as four-way stops. Ohio 602, between Crestline and Lower Leesville roads, is closed until further notice, according to the Crawford County Sheriff’s Office. The heavieststorm damage begins west of North Robinson and ends near Hook Road in Richland County. Employees with the Crawford County garage have set up road blocks on Lincoln Highway between Krichbaum and Nazor Road and on Krichbaum between Ohio 61 and the Lincoln Highway. Be wary of other drivers this morning and downed limbs and power lines.